Can't unlock encrypted external drive! Discussion in 'OS X Mavericks (10.9)' started by Swordylove, Nov 7, 2013. Okay first of all, 'as usual' my external drive (used for Time Machine backup) was 'unproperly ejected' as I wake the computer up. This happens since I bought the iMac (late 2012) and the external drive (Seagate Backup Plus 1TB), although it happens more frequently after 10.8.5 and now 10.9. Today, something worse happened. It asked me to enter the password to unlock the disk (it's encrypted). I entered the password and it shakes. It won't unlock! I've checked the hint and Keychain Access, I've entered the exact correct password a few times. I even copied it from the keychain and it still won't unlock! What's going on? Is my disk corrupted? Is it related to this problem? EDIT: I've also tried unplugging and plugging the drive back in, and it still asks for password and won't accept the (correct) password that I enter. It's also not appearing on my 'Devices' menu. Try it in Disk Utility. Look in the File menu and try to unlock it from there then do a disk repair. 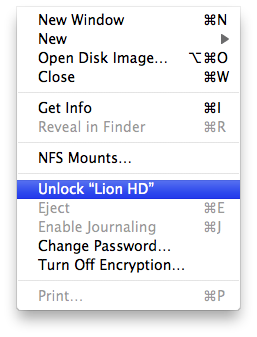 I think you mean "mount it from there" as I do not see any option to "unlock" it in the File menu. I tried to mount it but can't. It didn't ask for password, it just said can't be mounted. I clicked "Verify Disk" and it says everything is OK. I clicked "Repair Disk" and it stopped half way and says the disk can't be repaired. The window that asks for password to unlock the disk also simultaneously popped up - and the password still wouldn't work. Hopefully you made a backup. Next time, think twice about encrypting or otherwise password-protecting your drives, especially if it's being used as a backup. Backups should be as easy to "get into" as possible -- because the very reason one _needs_ a backup is usually in a situation of "duress". If you need "security", lock the drive up in something. Nope... I mean unlock. It would look like this. I suspect you are not seeing that option because the partition won't mount. Can you see the drive, but just not the partition in Disk Util? Attach the drive then enter "diskutil cs list" (without the quotes) in Terminal then post up the output. This migt sound silly, but what happens if you cancel the dialog asking for the key? I also have an encrypted backup drive, and for some reason plugging it in occasionally makes a non-functional passkey dialog pop up. It won't accept the passkey I know is correct, but if I just cancel the dialog, the key is fetched from my keyring and the partition unlocks and mounts normally. It is a backup drive. Currently all the files that I (currently) care about are in my Mac. It just means that I probably won't be able to recover anything if something happens to the my Mac HD. And I don't have any other external drive at the moment. I feel so sorry for all those who lost all their files in their external storage drives when I read the WD thread. That means it only shows either "Unlock" or "Mount" if there's where it is. So I can't unlock because it's not mounted. I can see the partition, but it's greyed out. Nothing happens, it just won't mount. That diskutil cs list output looks correct. All I can think of is somehow the encrypted core storage volume was corrupted. If you want to wipe it out and reformat to start over, enter the command below in Terminal. After that you will be able to reformat the disk in Disk Utility. After the reformat, run Disk Repair to see if any errors show up. That string after the command is the UUID of the core storage logical volume group. Of course any data on there will be gone. I've had issues with an external hard disk encrypted with the time machine backups. I've had to format it. But even now sometimes it fails do decrypt it. A thing that I've noticed also is that when I plug the hard drive is asks for the password, I type it and it mounts but it says the password is wrong (but I can see my files just fine). Okay, thanks a lot for your help. I'll call AppleCare sometime and ask for their advice. If nothing else can be done, I'll just proceed with starting over. Please let me know what they say. I am curious if they have a better solution. This is a bit scary but it just undermines the necessity for multiple backups, especially if you care about version history. I know the OP probably knows this but for the benefit of anyone on the internet finding this post, I'll outline a few thoughts here. * Use SuperDuper to create a bootable clone once a week. This is your last line of defense. Basically if you lose a file, you restore from Time Machine as always. No worries. If your Time Machine drive dies a horrible death or can't be accessed, you can restore a file from CrashPlan+. Additionally, you can swap out your Time Machine for the backup Time Machine and haven't lost anythying. No worries. If you lose both Time Machine drives simultaneously (say, your kid decides to play with matches and your house burns down...), you can restore from CrashPlan+ (which also has versions) and start over on Time Machine backups. Not all is lost. Finally, if all else fails (say both Time Machines fail and CrashPlan goes out of business), you have a fully bootable clone. As long as you took steps to correct any failures as they occur, the liklihood of all backups failing at the same time (plus the original computer) are acceptably low in most circumstances. I've called them. They guided me to reset the P-RAM or whatever by shutting down the Mac and unplugging for about 15 secs. And when that didn't work, they asked me to restart and press command+option+P+R during the chime. That didn't work either. So they finally told me to just reformat the disk. So I reformatted the disk from the Disk Utility. I didn't do what you suggested using the Terminal. That is okay right? I'm a bit nervous with Terminal (since I'm a noob with it) and only use it as last resort or just to get hidden informations. Sure that's fine if you were able to reformat? I was under the impression you were not able to mount so a format was not possible, and that is why I gave you the command to kill the encrypted volume first, but if you got it to reformat without that command... you are in good shape. You might also do a "verify disk" on that drive now and then again every few days to make sure there are no errors popping up. It could be the drive is beginning to fail and that caused your problems, and hopefully a verify disk check in Disk Utility would detect any issues coming up. Solving the error message on wake may not be easy; you may have to try a different drive manufacturer, or wait for a fix, or manually unmount the drive before you sleep the machine, but as long as you treat this message as a normal event, you should expect to reformat this drive on a regular basis. Yeah the partition was greyed out, unmountable, but still erasable. Thanks again for all your help. Now I eject the disk every time before going to sleep. Do you know if there is an easier and faster way (that is readily available in OS X) to remount the disk instead of going to Disk Utility or unplug-replug? Do you know if there is an easier and faster way (that is readily available in OS X) to remount the disk instead of going to Disk Utility or unplug-replug? 'diskutil mount /dev/yourexternaldevice' in Terminal? The same thing happened to me a week or so ago. I don't mean to dumb down this thread by suggesting too simple a solution, but you might try replacing the USB cord (if that's how your drive is connected to your Mac. For me, the only problem was a defective connection between my drive and my macbook. I replaced the USB cord (which had been a very cheap one) with a new one and now my drive mounts perfectly with the password. Since my external drive is my backup too, I'm very relieved! I'm facing a similar (if not the same) issue with my external drive (encrypted SSD in an USB enclosure). The drive is listed in disk utility, but the logical volume appears grayed-out. The only available option is "unlock" which doesn't work. The exact same thing happened to me - today. I have an external USB 3.0 WD My Passport that I use for my TM / and encrypted. I tried to verify & repair it. I unplugged it in, plugged it back in.... and even tried to do these things on another MBP in the house. Nothing worked. Then I remembered that this type of thing happened before. An external HD (a different WD My Passport) was inappropriately unplugged. In short, it was not ejected properly & the computer let me know it at the time. The solution BOTH TIMES was to essentially plug the drive back in... and let it sit there for 15 - 30 minutes. Both times the drive eventually became recognizable and self-repaired. Today, it happened discreetly and I didn't even see it happen. So, before reformatting & all that.... plug it in and let it just sit there. Maybe it'll just work itself out? It did for me... twice. That being said, the 2nd time it happened was today... and I have not unplugged the drive since. So, I'm not sure what'll happen when I unplug it. When this happened previously.... everything was A-OK. If your external drive is also your back up, you don't have a back up. If that's your only plan you are fried if there is a problem. See dean1012's post above for a good back up strategy. I had the same problem. Time Machine corrupted by not safely removing hardware. The password which I knew was correct was not accepted in any way! Disk Utility also said could not mount, try first aid. So I did and Verify Disk showed you need to repair the disk but the Repair Disk was greyed out. However after trying a lot, via the menu bar selecting Decrypt Volume accepted my password, said it was going to work in the background and the Time Machine was mounted after a couple of minutes!!! Now Time Machine says it is on 30% of Decrypting Backup Disk... so fingers crossed. Update: I cannot rule out Mrtravel123's solution, for I also have a WD My Passport. So maybe the solution was just keep it plugged in. Update2: It worked! I recovered all data.